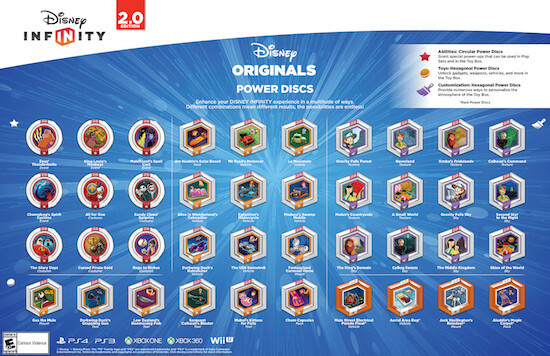 Power Discs are discs that are placed on the Disney Infinity Base in order to give a character special abilities and power upgrades, or to place certain toys or customizations in the Toy Box. Power discs come in two shapes: circular or hexagonal. Originally the discs of Disney Infinity and Disney Infinity 2.0 were sold in blind packs of two discs each, sold for $4.99 a pack. The idea was that kids would enjoy trading their doubles. That didn’t go over as well as planned and Disney heard our woes. Now with Disney Infinity 3.0, this has changed where the power discs are sold in themed packs of four discs each for $9.99 per pack. Now you can see exactly what you’re buying and can avoid having multiples of one particular disc. 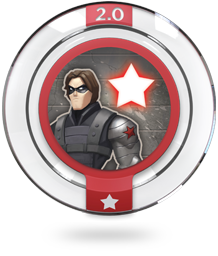 Circular power discs are discs that are placed under a figure on the Disney Infinity Base to give them special abilities. This type of disc is a Red Color and has a Star Symbol. An ability disc only affects the character it is underneath on the base. If a disc is removed, so are its effects. Any combination can be configured between characters and ability discs. Only a total of two discs can be used at one time under a character. Disney Infinity 2.0, added three new types of circular discs to the game: costume change discs, team-up discs, and event discs. Costume change discs possess a dual function: they enhance a characters’ abilities in the exact same way that the ability discs do( Disney Infinity Original version), but they are also equipped with the added bonus of changing the entire outfit and appearance of the specific character displayed on the disc when in use. For example, Sandy Claws Surprise is a costume change disc for Jack Skellington in Disney Infinity 2.0, which gives him his Santa Claus costume from The Nightmare Before Christmas. It also increases the damage inflicted by the player’s attacks, which it does for any character that uses it. Or another, Cursed Pirate Gold decreases the damage taken by any character that uses it, but it also changes Captain Jack Sparrow’s appearance to his cursed form from Pirates of the Caribbean: The Curse of the Black Pearl. So these discs will give any character an extra power, but when combined with its specific character it will give that character a costume change. Team-Up discs allow players to temporarily spawn another character into the game to fight alongside them in battle. Characters that can be called upon using their team-up disc are Iron Man, Winter Solider, White Tiger, and more. After use, a team-up power disc must be allowed to recharge, the player must wait until the yellow power meter surrounding the disc’s icon on the left side of the screen has filled up before the disc can be used again. Event discs are similar to team-up discs, but rather than summoning a character, they trigger an event in the game that harms your enemies. For example, with the Marvel-shield-helicarrier-strike you can send down a missile strike from above. Your enemies will need to take cover! Event discs must be recharged after use just like team-up discs. *Only Two Circular discs can be placed under a character at one time. Any more and the character becomes unreadable to the base. 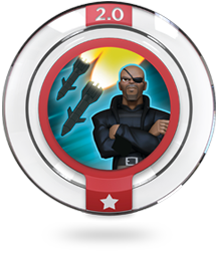 *Ability discs can be used both in the Toy Box and all Play Sets in their compatible games, with the exception that Disney Original event power discs cannot enter into Marvel Comics-themed play sets in Disney Infinity 2.0. Nor can 2.0 discs be used on the original version. Hexagonal power discs are discs that are placed on the hexagonal slot at the back of the Disney Infinity Base, where a Play Set piece would normally go. Unlike round power discs, they can only be used in the Toy Box, and not in play sets or Toy Box Games. 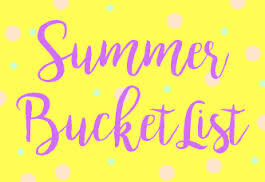 There are two types of hexagonal power discs: toy discs, which place toys in your toy box, and customization discs, which change the terrain theme, sky, and music of the toy box. Toy power discs are hexagonal discs that summon a toy for use in the Toy Box, and are an orange color and have a ball at the bottom of the disc. These discs unlock gadgets, weapons, vehicles and much more within the Toy Box Worlds. 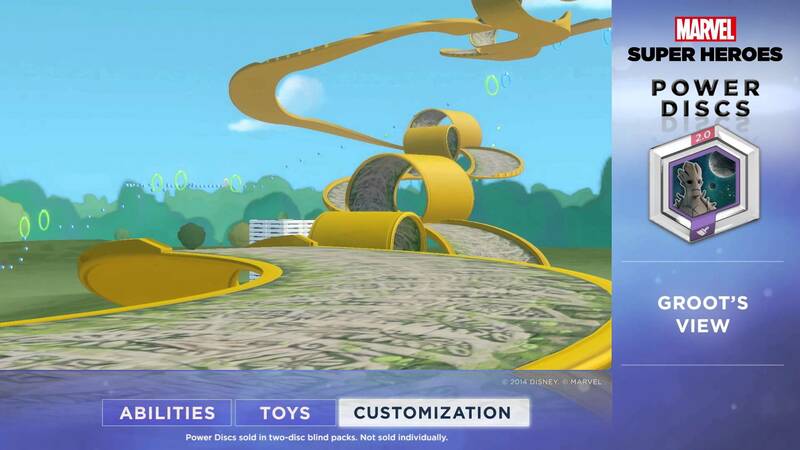 These toys will only appear in-game when the specific Toy Power Disc is placed on the Disney Infinity base. Once you have removed the disc the item will disappear. Customization discs are hexagonal discs that change the environment/theme of the Toy Box, they are a purple color and have a paintbrush at the bottom of the disc. The theme goes with the characters world that is displayed on the disc. Sky themes allow you to change the Toy Box World’s sky background as well as music to match the theme of the Power Disc. The Terrain/theme discs allow you to change the terrain of the Toy Box World, to create a completely new visual world all the way down to the plants. You can mix and match all of the customization power discs, alternating different themes with one another. Once you have used the discs to change the sky and terrain, you can then remove them from the base and use other hexagonal discs, and your theme will remain. * Only three hexagonal discs can be placed on the base at one time.